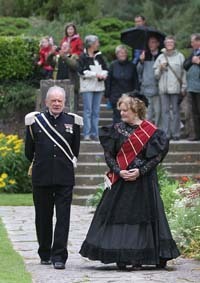 August 2011 marked the one hundred and fiftieth anniversary of the visit of Queen Victoria to Killarney and to Muckross House, in August 1861. To mark that occasion, members of Dóchas Drama Group, Killarney, surprised many visitors to Muckross by re-enacting scenes, from the royal visit, throughout the House. These re-enactments took place over several weekends during August 2011. They were largely, but not exclusively, based on research carried out by the staff of Muckross House Research Library, on the newspaper reports of the time. It is unfortunate that, with one or two exceptions, little archival material relating to the royal visit survives at Muckross House. Muckross House Research Library also hosted a seminar relating to the royal visit on 27th August 2011 ( Muckross Newsletter Autumn/Winter 2011 ). The 27th of August was the exact date on which, one hundred and fifty years earlier, the Queen had arrived at Muckross. An exhibition, relating to the royal visit, was also mounted at Muckross House. Much of the research material relating to the royal visit was subsequently used as the basis for a radio programme, which was produced and presented by Independent Radio Producer J.J. O’Shea. This one-hour programme was broadcast on Radio Kerry on Christmas Day 2012. Members of Dóchas Drama Group, Killarney, portrayed the royals as they once again re-enacted some of the scenes from the visit. The staff of Muckross House Research Library are very grateful to Dóchas Drama Group, Killarney, and to Mr J.J. O’Shea for their enthusiastic support of this project. In particular, we are grateful to Radio Kerry for permission to make the programme available here. Total Time - 45mins. | 33 - Segments. 2 Who was Queen Victoria? 3 Who was Valentine Augustus and his wife Gertrude and what role did they play in the development of Killarney? 5 Who were the Herberts of Muckross House, Killarney? 8 Queen Victoria's journey to Killarney, by train, from Dublin, Monday 26 August 1861. 9 Security measures undertaken in Killarney town for the visit of Queen Victoria. 10 The royal family's arrival at Killarney Railway Station, Monday 26 August 1861. 11 The Queen's arrival at Killarney House, home of Valentine Augustus Browne, Viscount Castlerosse, Monday evening 26 August 1861. 12 Dinner served for the Queen at Killarney House, home of the Viscount Castlerosse, Monday evening 26 August 1861. A reconstruction. 13 Queen Victoria's first day upon the Lakes of Killarney, Tuesday 27th August 1861. 14 The Queen’s own published account of her first day upon Killarney’s Lakes, Tuesday 27th August 1861. 15 The Boatmen of Killarney’s Lakes. 16 Glena Cottage and Glena Bay, where the Queen and royal party lunched, Tuesday 27th August 1861. 17 The Queen’s published account of her journey under the Old Weir Bridge, her visit to Derrycunihy, and her return to Killarney House, Tuesday 27th August 1861. 18 Preparations undertaken at Muckross House, home of the Herbert family, for Queen Victoria’s visit. 19 Awaiting the Queen’s arrival at Muckross House ‘below stairs’ with the staff of Muckross House. A reconstruction. 20 Queen Victoria’s arrival at Muckross House, Tuesday evening, 27th August 1861. 21 Mary Herbert, of Muckross House, an accomplished Victorian water-colourist. 23 Queen Victoria views the scenery of the Muckross Estate, including Torc Waterfall, Wednesday 28th August 1861. 24 Queen Victoria christens a promontory on the north side of Muckross Lake, ‘Victoria Point’. 25 The Queen views a stag hunt upon Lough Leane (the Lower Lake), Wednesday 28th August 1861. 26 Colonel Herbert steers his boat carrying the Queen among a flotilla of boats on the Lough Leane (the Lower Lake) Wednesday 28th August 1861. 27 Queen Victoria’s visit to Muckross Abbey, Thursday morning, 28th August 1861. 28 Queen Victoria’s departure from Muckross, and from Killarney, Thursday 28th August 1861. 29 Other visits of the English royal family to Killarney, during the latter part of the 19th century. 30 The decline in the fortunes of the Herbert family of Muckross, during the latter part of the 19th century. 31 Photography during the Victorian era. 32 Destitution in Killarney during the 19th century. 33 Extract from a letter written by Princess Helena (3rd daughter of Queen Victoria) to Blanche Herbert, daughter of Henry Arthur Herbert of Muckross, September 1861. Queen Victoria and Albert Prince Consort, in the gardens at Muckross, August 1861.